Packages to Fernando de Noronha and Salvador, Brazil . Salvador is a great place to include on your Brazilian itinerary when visiting Fernando de Noronha. Get the tip from our local experts, learn about the package options to Noronha before you go. 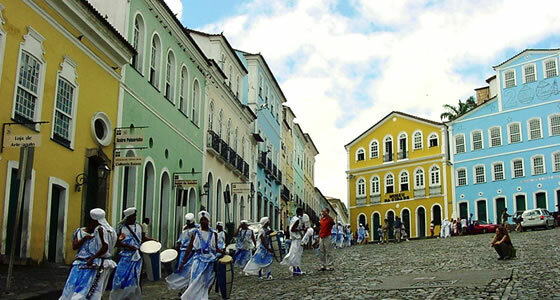 The capital of the state of Bahia and home to a World Heritage Site, a pulsating music scene and vibrant carnival celebrations, Salvador is one of the seats of Brazilian culture. Salvador was the original capital of Brazil for about 200 years and also home to the first slaves who arrived to work on sugar plantations. A World Heritage site, The Old City or Pelourinho, with its winding cobblestone streets, has numerous well maintained structures such as of the Renaissance period, the Igreja da Ordem Terceira de São Francisco church, while brightly colored buildings decorated with intricate stucco work or Portuguese Azulejo tiles abound. The African influence is evident everywhere, from women dressed in ethnic white clothes selling Bahian delicacies to someone playing the berimbau, a bowed instrument while someone else practices capoeira, a dance form of martial arts. Another evident African influence is the Candomblé or worshipping of ancestral souls. Many famous Brazilian musicians of the past and present decades emerged from Salvador, including Gilberto Gil and Caetano Veloso. The African slaves who worked in plantations in the Bahia region developed over the years a culture, including dance and music quite different from other parts of Brazil, such as Samba,Samba-Reggae and Axe. Several bars and restaurants like the Galpão Cheio de Assunto and Boteco São Jorge have various musical performances, including percussion and samba. carrying the city’s popular performers such as Gilberto Gil, Olodum, Daniela Mercury, Carlinhos Brown, Timbalada and Margareth Menezes who are accompanied by dancers. There is the opportunity to participate, by dancing and mingling with the locals, rather than just be a spectator. Just as with the music and dance of the Bahian region, the food of this area also sees an African influence. Fried bean dumplings called Aracajé found in Salvador for example, can also be found in West Africa by a slightly different name. Moqueca is Bahia’s signature dish, made from seafood stewed in palm oil and coconut milk. Restaurants serving local food include Porto do Moreira, Recanto das Tias, Cruz do Pascoal and O Cravinho.